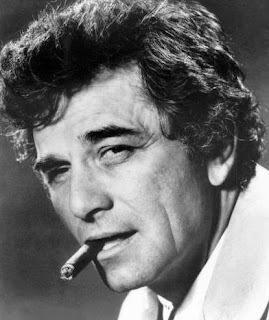 When the news broke of Peter Falk’s passing, I remembered that I’d seen him in person many years ago. I was thirteen years old and I was with my family in Hollywood. We were on a big California vacation. I was about a year into my classic Hollywood obsession and was very impressed by the footprints in front of Grauman’s Chinese Theater. The only other star I remember seeing is Peter Falk. Everyone else had glided out of that theater with heads held up straight and big gleaming grins. Falk didn’t glide, he ambled. He had a sort of left-to-right gait that fit nicely with his friendly grin. My mom said something about how rumpled he looked, and I remember being annoyed by that. He struck me as so likeable that I wanted to defend him. I thought “comfortable” was a better term. Falk looked at ease in his own skin. I didn’t know at the time that he had a glass eye, but I noticed the droop on that side. It made him look like he was constantly winking, which added to his appeal. Of all the things from that night that I can no longer remember, I haven't forgotten one moment of his walk down the red carpet. His warm, friendly demeanor made me love him instantly, and while I couldn’t put it into words at the time, I began to understand the sort of charisma that made an actor a star. Thank you for sharing your Peter Falk, memory with us.. I really loved his acting.. I was so sad to hear of his passing. I enjoyed this post. You hit the nail on the head about perception. Your mother saw "rumpled" and you saw "comfortable." Some actors just have that certain something...for some. And thank you litabuff! I do think it's interesting how our varied impressions of these stars can sometimes make one person seem like many. It says a lot about how different we are from each other.